Only 15 000 students out of 23 000 students who sat for the Grade 12 examination were eligible for selection into tertiary institutions while remaining 8 000 missed out. This is according to the Tertiary Admissions and Scholarship Division under the Department of Higher Education, Research, Science and Technology. The 15 000 were eligible to continue into tertiary institutions after scoring the required Grade Point Average (GPA) of between 1.6 to 4 points, however, only 10 000 were accepted. Currently, there are 5 000 Grade 12 school leavers from 2016 who are qualified or are eligible for tertiary institutions, but were not accepted. They will be now forced to find spaces in institutions or upgrade their marks just like the other 8 000 school leavers who were not eligible for selection and are encouraged to upgrade. Executive Manager of Tertiary Admissions and Scholarship Division, Thimon Bune, was addressing the students and staff of the University of Technology during their orientation program this week at the Taraka campus. Mr Bune said this now means that universities and colleges have no choice but to start selecting eligible students starting from the top. In other words, selectors in the various institutions will start selecting eligible students starting with those with GPA's of 4 or those scored straight A's, until they reach their set quota. 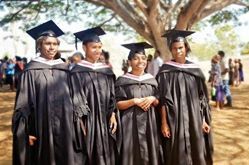 Mr Bune said other latest improvements include a K30 fortnightly allowance for each selected students under the Tertiary Education Scholarship Assistance Scheme (TESAS) starting this year.